Cobblestone Mill Woodworks, Inc. of Ball Ground, Georgia is a wholesale manufacturer of quality exterior wooden raised panel shutters, louver blinds, and moveable louvers. Our interior product line includes louver and panel doors, interior panel shutters, bi-fold, dressing room and handcrafted café doors. We provide our clientele with a variety of custom sized shutters and blinds, including radius and segment tops, transom and combination shutters with decorative cut-outs. We offer a complete line of shutter hardware, cafe café and functional Bahama shutter hardware. Our shutters and blinds are manufactured exclusively with western red cedar. Having limited availability, western red cedar is renowned for its excellent exterior grade qualities, with outstanding durability and resistance to decay from termites or inclement weather. Western red cedar contains no pitch or resin pockets that can ruin finish paint or stain application. Western red cedar has straight grain characteristics, which help in its natural ability to prevent warping, splitting, and/or bowing. Over the years, western red cedar has been successfully used in exterior products such as fencing, decking, and siding. Our new state of the art facility, with new high tech equipment, such as computerized router, allows mass production of stock size, heavy duty shutters, blinds, and doors to order. Production time generally is one to two weeks. 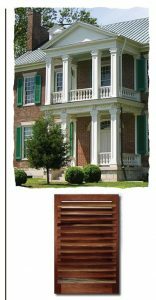 Our equipment also allows us to closely duplicate or reproduce your historic and/or custom blinds and shutters, while using the highest quality standards in the industry today. We can manufacture any width, length, height, or thickness, using any species your customer’s needs.